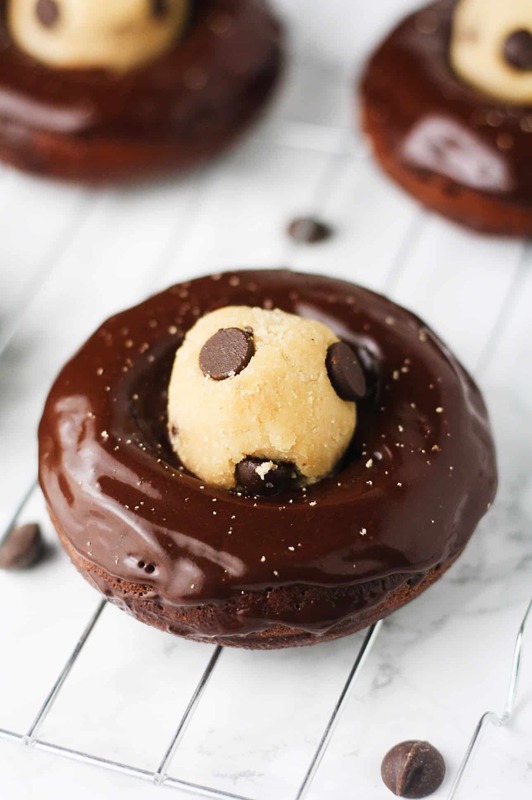 These Gluten Free Chocolate Cookie Dough Donuts are more than just a mouthful to say…..they’re SO DARN GOOD. One of those projects is centered on providing more of a gluten free variety here on my little blog. I’ve always been a fan of boosting the nutritional value in my recipes by substituting whole wheat flour whenever I can. However, I realize that this doesn’t give any advantage to my gluten free buddies OR my low carb pals. This is why I have decided to take a little dive into the wonderful world of almond flour and empty my college funds while I’m at it (seriously though, almond flour why are you so expensive)? Another great product that I’ve decided to add to my ingredient army is this Truvia Baking Blend. LOVE IT! Now, this isn’t the first time that I have experimented with sweeteners and low calorie sugar substitutes. However, they have all never failed to leave a bad aftertaste in my mouth. I just can’t train my taste buds to completely dismiss the taste of real sugar and accept sugar free replacements. BUT, this baking blend is seriously the beez kneez. I think that the fact that it still contains a hint of sugar is the key to it not leaving a bad taste in my mouth. As if that wasn’t already good enough, a little goes a loooooong way. 1 tbs was all that I used in these donuts and they hit my sweet tooth just right. I recently purchased this donut pan from Michael’s for under $10 (with a 40% off coupon) and I’ve been dying to put it to the test. SO, I figured that there was no better way to break it in than with a batch of Gluten Free Double Chocolate Cookie Dough Donuts, amiright? Worked like a charm. I found that it was much easier to fill the pan by transferring the batter to a ziploc bag first. I then cut off a corner and piped the batter into the greased pan. Also, the first time that I tried this recipe, I baked the donuts at 350 degrees F and found that the outside cooked way too quickly. Round two, I lowered the heat to 300 degrees and they came out perfectly! Oh so slightly crispy on the outside, soft and fluffy on the inside. NOM. Now for this gluten free, low carb cookie dough deliciousness. A mixture of almond flour and coconut flour was used to create the perfect consistency. Although I personally think that it’s almost impossible to bake a recipe entirely using coconut flour, I love its absorbent properties in combination with other flours. It literally soaks up anything and EVERYTHING in it’s path, it’s actually pretty cray. Almond milk was absolutely needed in addition to lite vegetable oil spread in order to get the dough to come together. The dough is then rolled into 8 separate little balls – which will be added to the center of each donut after glazing. I found that keeping my hands wet while rolling the dough made the process oh so much easier. The super simple, 2 ingredient glaze that is added on the donuts is the perfect finishing touch. Who knew that a couple tablespoons of unsweetened cocoa powder and 1/4 cup of sugar free maple syrup could create something so wonderful? The low cal life is schweeeeet. To increase the protein content, I added a scoop of Premier Protein Chocolate Whey Powder to the batter. This helped these little donuts to pack in 10 g of protein each! Nom away my friends! Kick-start your morning with these delicious Gluten Free Chocolate Cookie Dough Donuts. They are low in calories, high in protein and highly delicious! Preheat oven to 300 degrees F. In a large bowl, combine the almond flour, coconut flour, baking soda, salt, cocoa powder, Truvia baking blend and protein powder. In a separate bowl, whisk together the eggs, vanilla extract and Greek yogurt. Pour the wet ingredients into the dry ingredients and mix thoroughly. Transfer the mixture to a ziploc bag and cut off one of the corners to create a piping bag. Pipe the mixture into 8 separate cavities of a greased donut pan. Bake for 12-15 minutes or until a toothpick inserted into a donut comes out clean. Allow to cool slightly. While the donuts are baking, combine all of the cookie dough ingredients into a bowl and mix together using a fork or your hands. Roll the dough into 8 separate balls and set aside (this process is much easier is hands are slightly wet). In another bowl, combine the maple syrup with the cocoa powder and spread the glaze over each donut. Add a cookie dough ball to the center of each donut and enjoy! We don't all use the same products. How many grams or cups of protein powder is "one scoop"? With both cookie dough and chocolate donut in the title, it's hard to believe that these are healthy! I'm drooling!